As part of my master bedroom makeover, I installed a beautiful wood paneled wall for less than $90. I will share all the details with you here! I read a few tutorials on the best way to accomplish this look and I won't lie, they were pretty detailed and seemed complicated as well as time consuming. I was looking to complete my entire remodel in 1 week or less, plus I had a fairly tight budget. I decided to "dumb it down" a bit and skip a step. Similar to when I installed the board and batten to my dining room walls, I decided to forgo building out the wall with sheets of plywood first. That meant my first step would be to tape off the desired height of my paneling and paint the wall white. This took 2 coats of Behr Premium, paint and primer in one, in the color Bleached Linen. This is the same color I have used on all the trim throughout my house, in an eggshell finish. I know it's typical to paint trim, moldings and casings in a more glossy finish, but I am covering orange oak trim in my house and the eggshell hides more imperfections and wood texture. Once the paint is dry it's time to hang your first piece of trim. This will be the horizontal piece at the top height of your wall. I am using primed, mdf 4" trim pieces in 12ft sections, purchased from Home Depot. For me, I am going straight across from the break in my wall, before the cathedral or angled ceiling and wall start. Be sure to check for level before nailing your trim piece in! I will say, having a nail gun like this one from Ryobi makes this job so much easier! So does having a partner in crime! I did everything in this space solo, except hang this first piece. There is just no way I could hold a 12 ft long section of trim 93 in above my head and nail it in while keeping it level! Even with the hubs and I, there was no way we could do that, AND take a picture, so this step is photo lacking! 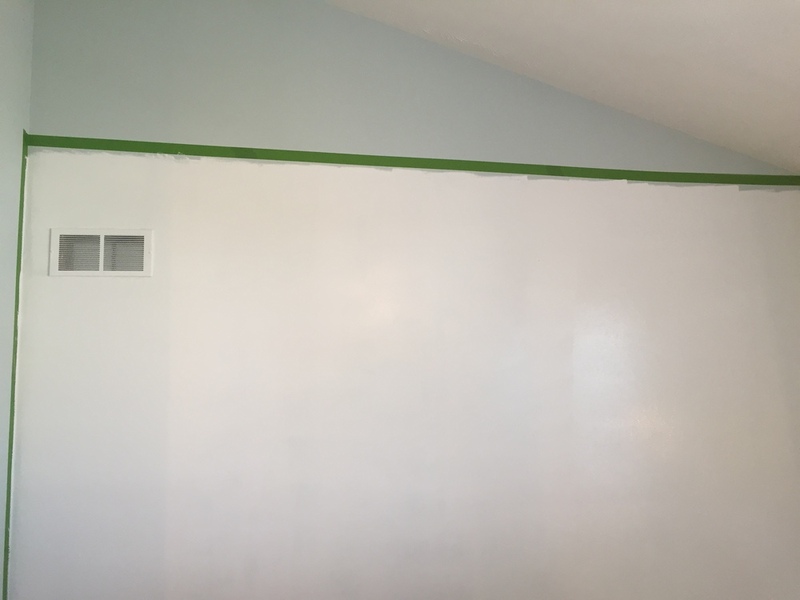 Once your top piece is leveled and installed, it's time to attach your vertical boards, equally spaced, along the wall. A bit of math was required here and that is not my strong suit, so I needed a calculator! 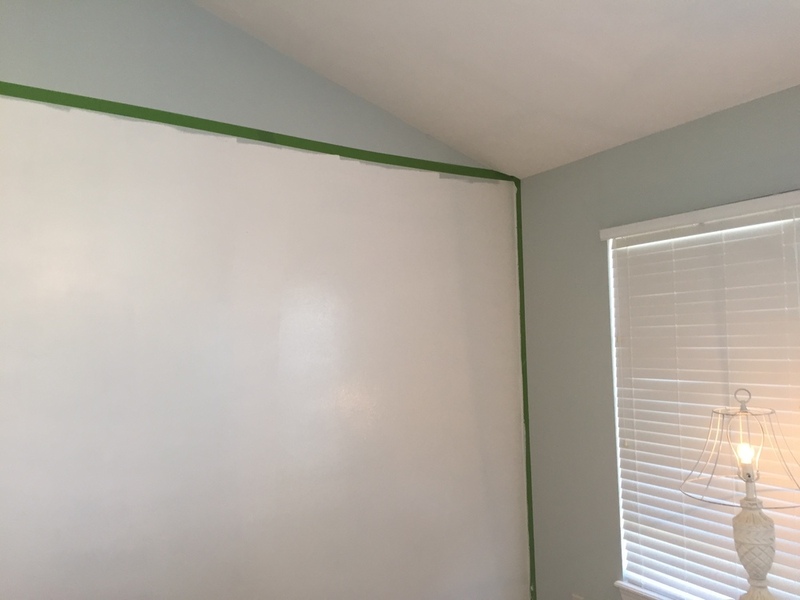 I knew I wanted my finished "boxes" to be about 24" squared, so I did some dividing by the width and height of my wall to determine my boards would be about 22.5 in apart to cover my wall space evenly. These boards were also attached using my Ryobi nail gun. You can see that my previous "tape" line from painting was NOT level, good thing I checked that before installing the wood trim! Once your vertical boards are installed it's time to add the horizontal, connecting pieces. These all need to be cut to size to fit the spaces between the vertical boards. I would recommend measuring before each cut. Being off even a centimeter means more caulking and sanding later! To cut the trim, I am lucky to have a Ryobi miter saw and stand, it makes the job go by so much faster! Don't forget also to use your level to make sure each connecting piece is in line with the one next to it! Here is a shot of the wall after all the trim has been installed. Now comes the longest step... filling the seams with caulk. I used a paintable caulk with my caulking gun, followed by wiping it smooth with a wet paper towel. After the caulk is dry, you will sand, sand and sand again, then paint. If you have any questions, please leave them in the comments below, or email me at theothersideofneutral@gmail.com I love you hear from you!